The Pepe’s Loyalty Card is our way of saying THANK YOU !! Our Loyalty Card rewards you every time you purchase. Once you’ve collected 6 or 12 points you will be rewarded with either a FREE Half Chicken or a FREE Whole Chicken (only one reward per Loyalty Card). If you haven’t picked up a Loyalty Card yet - visit your nearest Pepe’s store ! The Pepe's loyalty cards are valid in participating stores only. 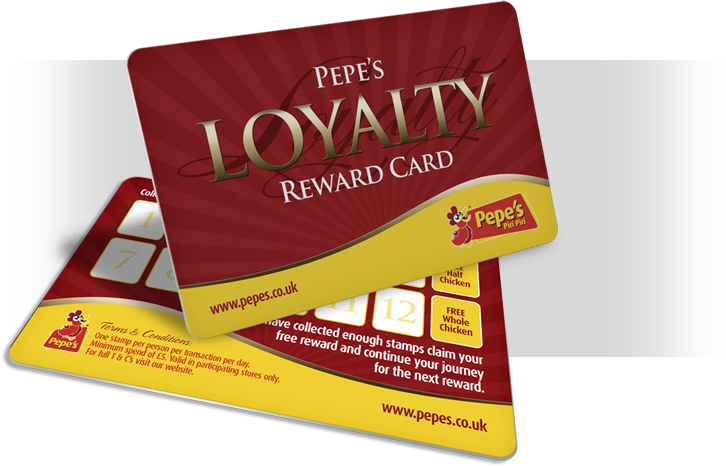 Only one Pepe's loyalty card can be redeemed in any 24 hour period. Completed cards must be redeemed within 1 month of being completed otherwise they will become void. Pepe's Student Loyalty Cards are only available for people aged 18 or under and in full or part time education. Proof of age and education need to be provided on request. On presenting your loyalty card you will receive a Pepe's stamp at the time of your transaction. You will receive a Pepe's stamp on your Pepe's Loyalty Card when you spend £5 or more in a single transaction or a Pepe's stamp on your Pepe's Student Loyalty Card when you spend £1.99 or more in a single transaction. Only one card will be stamped for a single transaction. Pepe's Student Loyalty Cards can only be used to obtain stamps and redeem rewards Monday to Friday between 11:00 - 17:00. The Pepe's stamps you receive are personal to you cannot pool your stamps with the stamps received by another individual and claim the reward together. Only original Pepe's Loyalty Cards and Pepe's Student Loyaalty Cards Will be Accepted.Photocopies or facsimiles are not valid. Only original Pepe's stamps issued by Pepe's staff at the time of purchase will be valid.Any unofficial Pepe's stamps will invalidate the Pepe's Loyalty Card or Pepe's Student Loyalty Card. Pepe's Loyalty Cards can only be redeemed once the requisite number of stamps have been collected and then only in the Pepe's store where the majority of stamps on the Loyalty Card were issued. Only one reward can be redeemed per individual Pepe's Loyalty Card. Should you elect to redeem a higher reward on the Loyalty Card, you are not entitled to the lower value reward(s). Rewards are subject to availability and the store reserves the right to replace a reward with a reward of at least the same value. For the Pepe's Loyalty Card an alternative vegetarian reward can be claimed:1st reward=1 Spicy Rice or 1 Paneer Rice 2nd reward = 1 Spicy Rice Meal or 1 Panner Rice Meal. For the Pepe's Student Loyalty Card an alternative vegetarian reward can be claimed for the 4th and 5th rewardup to the value of the original reward item. The Pepe's Loyalty Card and Pepe's student Loyalty Card cannot be used in conjunction with any other special offer or promotion. The Pepe's stamps,Pepe's Loyalty Cards have no cash redemption value. The Pepe's stamps,Pepe's Loyalty Cards,and Pepe's Student Loyalty Cards cannot be exchanged,sold or transferred. Any invalid Pepe's Loayalty Cards oe Pepe's student Loyalty Card will be retained by Pepe's staff and the Card will be cancelled and your inclusion in the scheme will be withdrawn. If you breach these Terms or abuse the Scheme, or Pepe's reasonably believes that you have done so, your Pepe's Loyalty Card and/or Pepe's student Loyalty Card will be cancelled and your inclusion in the scheme will be withdrawn. c. withdraw or cancel any Loyalty Card Scheme without notice. These terms and condition will be governed by the law of England and Wales.